No other city in Russia has given the world so many contributions of art, architecture and literature quite like St. Petersburg. 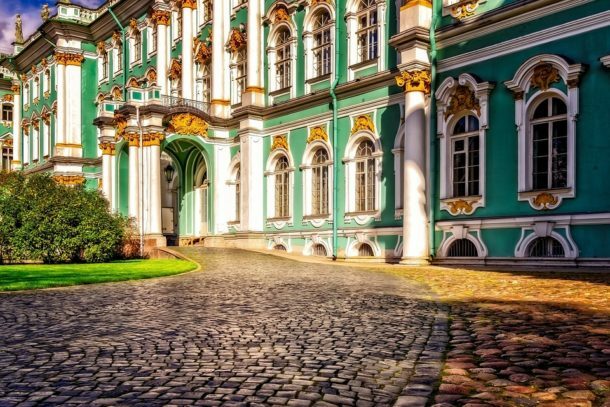 Checkhov, Dostoyevsky, Tchaikovsky and the romantic poet Pushkin all called it home, and today one of the world’s largest collections of art and antiquities, The Hermitage, located on the site of the original Winter Palace, welcomes visitors from around the world and throughout the year. Lovers of history can choose from many different St. Petersburg wedding venues, including the elaborate St. Petersburg Opera, an island fortress, or an early 19th century rose pavilion. There are numerous plazas, Italianate mansions and palaces along the canal system that can host special events and luxury sites with water or city views are easily secured for your symbolic wedding ceremony and reception. Legal ceremonies require at least a 30-day stay and several forms of proof of identity, so most destination couples marry legally at home, then re-enact their wedding for friends and family in one of St. Petersburg’s many wedding properties. The Cocoon Events team of St. Petersburg wedding planners will consult with you and recommend which properties might best suit you. Russia’s famous White Nights take place in St. Petersburg during the mid-summer months when the city, located roughly as far north as Alaska, is bathed in light bright enough to read by all day and all night. It is a celebratory period when many visitors descend to experience its magical feel and attend one of many popular seasonal festivals. Spring and fall are both welcoming to couples with relatively mild temperatures, while winter is dark, cold and covered by a serene blanket of snow. The timeless, transcendent qualities of the city and its rare seasonal phenomena make it a St. Petersburg destination wedding something highly desirable and extremely magical. Traditional Russian ingredients add flavor to your custom wedding menus while your guests enjoy authentic folk entertainment. Your guests will never forget the unique strains of the balalaika or the athletics and beauty of a mesmerizing troupe of Cossack dancers. Our award-winning international design team will bring your wedding vision to life, and help create a harmonious pairing of your personal story with local context – the perfect dream wedding in St. Petersburg come true!